We make it easy to accept donations online! Included in every Connecting Member's Premium plan. With your online giving service your church or non-profit can accept both one-time and recurring donations from bank accounts and credit cards. 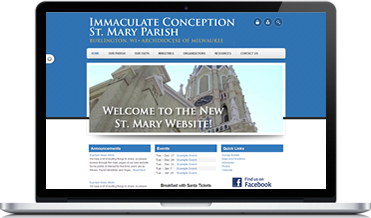 The flexible system also allows a Catholic parish or organization to accept payments for other one-time transactions and special events. 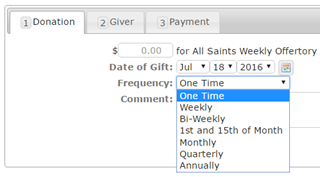 From a single online portal, your parish can manage all of the payment events between a church and its members. 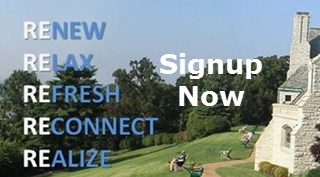 Collect money for special events, retreats and capital campaigns. Your administrative area even allows you to manually process transactions. 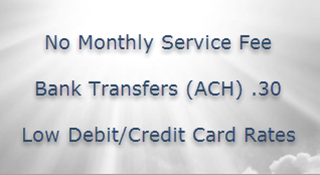 This means you can accept ACH payments for just about any event in the parish. Because we do not charge a % of the transaction amount (Discount Rate), many organizations process tuition payments, auction payments and other high dollar transactions. Hands down, the lowest fees in the industry. Your online giving account is integrated with a national leader in payment processing that works exclusively with non-profits. This means your rates are extremely low and the savings goes straight to your church. Collect more of the money that is being donated to you! Best of all there are no payment gateway accounts to setup which saves you even more. 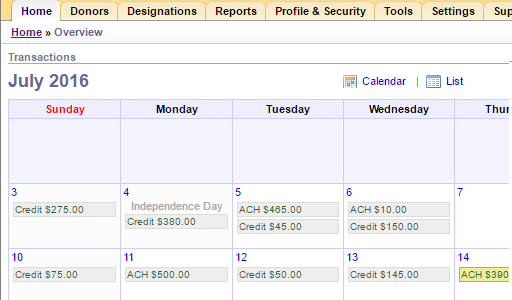 The Admin Control Panel allows you to mange every aspect of your account. 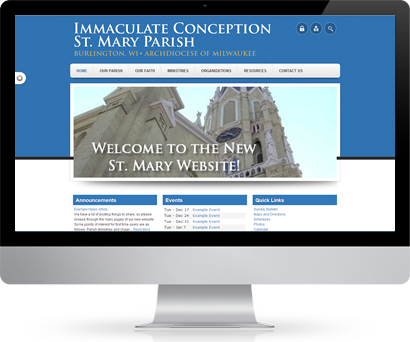 A few great features are: manually adding donors and gifts, providing tax reports each year, creating additional users who can help mange the program and an area for Envelop ID's so that your reports will sync with your parish software. 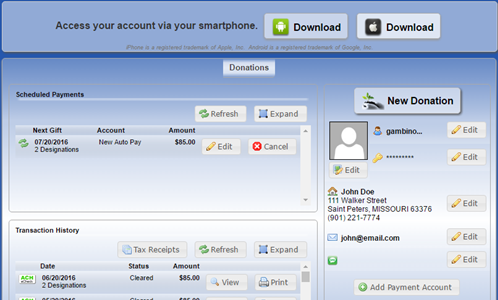 Your donor's can manage every aspect of their account online. This means less phone calls to the parish for changes. 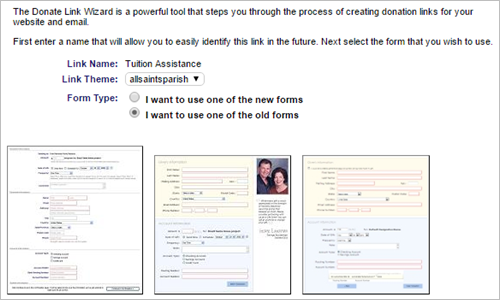 Your donors can: add new gifts, modify existing giving schedules, add new payment accounts, view a history of all transactioins and even print off a year-end tax report for accounting purposes. This wizard allows you to create a Unique URL for giving to a specific designation. Options include setting a specific amount, choosing a specific designation, form layout and available payment methods. Once the link is created you can place the URL on a specific area of the website or include in email newsletters. Record Keeping needs to be easy and we make that happen. The Reports area lets you easily export your data in various formats and date ranges. 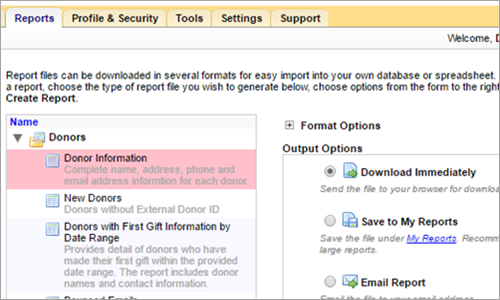 You can even save your most frequently used reports in a Favorites folder for quick access. If you don't see a report that works for you, let us know and we'll customize one for you. 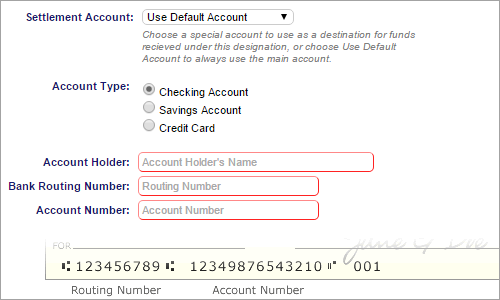 Setup Multiple Deposit Accounts - New! Don't Overlook this Feature! Multiple Settlement Accounts means you have the flexibility to add additional checking accounts where you wouild like funds deposited. This means that you can map specific designations to specific deposit accounts. For instance, School Designations deposit in the School Checking Account. The Forms Link Wizard creates forms to collect donations and payments with options that include choosing specific amount, designation, form layout and available payment methods. 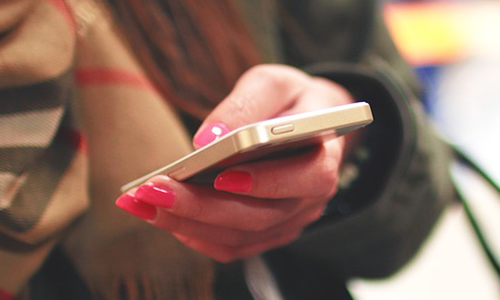 All forms are mobile friendly so that you can use them on the website and in the mobile app. Now you can collect money anywhere.. Since 2002, Trusted and Proven by Over Half a Billion Dollars of Transactions.